Sorry, Anon. I guess that’s not really true. Slaw, as we all know, is cabbage based. You take chopped cabbage and mix it with a dip (or sauce) to turn it into slaw. Oftentimes, people use mayonnaise as the base for this sauce. In my opinion, these people should not be allowed near a kitchen, much less a barbecue pit. In fairness, this is generally referred to as coleslaw. 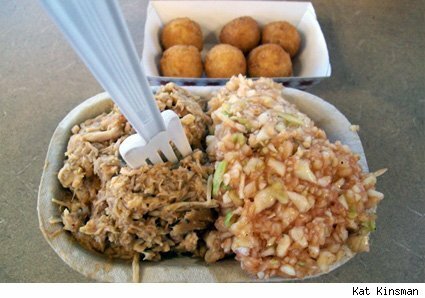 When I’m eating barbecue, what I want as a side is barbecue slaw. Barbecue slaw is cabbage mixed with vinegar and generally a few other ingredients that do not include mayonnaise. The best kind of barbecue slaw is Lexington red slaw. It consists of cabbage, cider vinegar, ketchup, salt, pepper, and red pepper flakes. Slap some of that on a chopped pork sandwich, and you’re in hog heaven.